The iKen Mod Kit from Kanger tech is the powerful iKen mod battery paired with the iKen Sub-Ohm Tank. It is constructed of stainless steel and glass, and comes in a several fashionable colors to choose from. These features produce many vaping hours and large, tasty vape clouds. 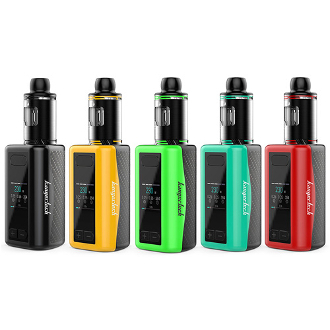 The iKen Box Mod has a built-in 5100mah battery and has a 230W capacity. It has several output modes: VW/Ni/Ti/SS/TCR(M1, M2) and a temperature control range of 200F-600F. This mod also has a 1.54 inch TFT display screen and three vaping modes (from beginner to expert). The iKen Sub-Ohm Tank has a 4ml liquid capacity and is a top-filling tank that has a convenient twist-off cap. The tank has an airflow located at the top of the tank as well as a leak resistant design. It utilizes the SSOCC atomizer heads which are used in a large number of other Kanger Tech tanks.